A lady contacted me having fleetingly viewed my work at the Hebcelt Festival. Having children in tow meant she didn’t have time to browse, so a private viewing was arranged. We then both had time to chat over what she liked best and why, and she chose a Callanish Stones painting complete with Harris tweed to remind her of home. Being asked to do a commission is such an honour. But also very scary. Rather than pleasing your own eye, suddenly your creation has to be everything that the customer wants. Luckily, in this case, my ‘old’ friend was able to clearly define the style, mood, and pallete of what she wanted. Still, nerve racking when finished and presented. What a beautiful location to spend a month in Residency. We set up our gallery flags and directions and received visitors who truly engaged in the creative process. A well received demo to Fearnan Art Club, and one-to-one art classes put the icing on the cake. We made some very special friends, met visitors from all round the world, and received fabulous feedback. I took the opportunity to develop my bleach on ink techniques, which you can view in the Animals gallery. Many thanks to the community of Tombreck and beyond who made us feel so welcome. A wonderful weekend in Stornoway! It was a challenge hanging paintings in a windy marquee on a slope, but well worth the effort to receive such lovely appreciative feedback. What an atmosphere … painting outdoors, surrounded by music, people of all ages, and the circus! Absolutely delighted to have this new website to showcase my creations, and to let you know when I'm exhibiting and where. If you like what you see, please do get in touch via the Contact Me page. I am delighted to support Hansel again this year, with 'Dancer'. The tenth 'Little Paintings' art event, showcasing some of Scotland's finest artists, will be held again at Murdoch House on the Broadmeadows Estate at Hansel from Friday 2nd to Sunday 4th March 2018. I have a few pieces showing at this lovely gallery. It has originals, prints, and a great selection of gifts. After many years of Millie, she is taking a back seat this year at the exhibition... but look out, she is there in miniature form! This year's competition is 'Ayrshire Image'. I have entered a collage piece of Dunure Harbour which I loved creating. Lots of wee surprises in it. Pop in if you can, it's a great exhibition, for a great charity. Artwork now available for sale online! 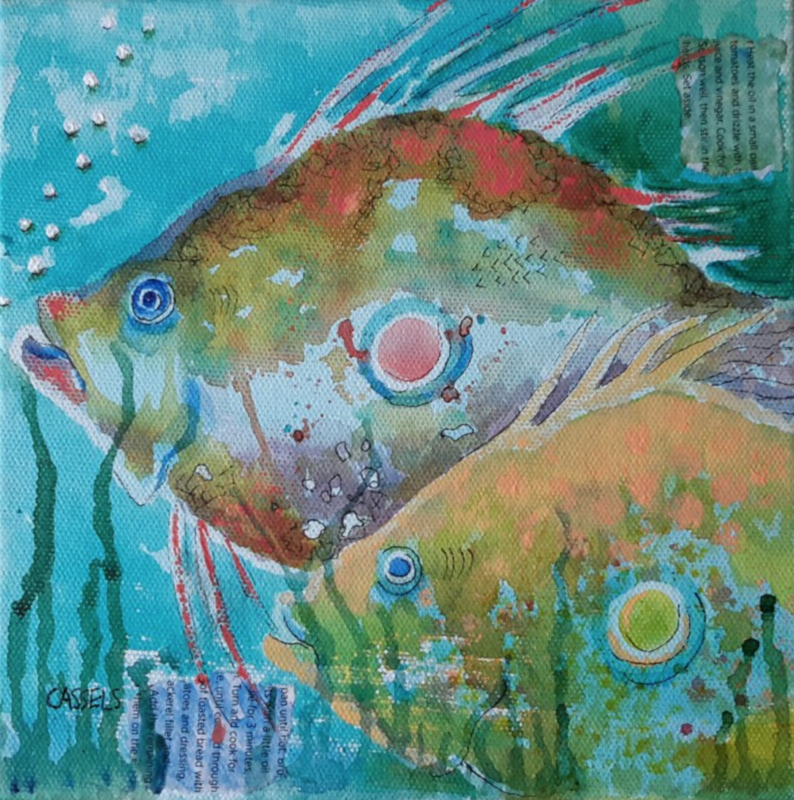 Click the link below, or find me under Artists A-Z, under C, or just search for Debbie Cassels. Enjoy! I shall be out and about exhibiting my work and contributing to open studios events. I am delighted to support Hansel again this year, with 'Fishface'. The ninth 'Little Paintings' art event, showcasing some of Scotland's finest artists, will be held again at Murdoch House on the Broadmeadows Estate at Hansel from Friday 10th to Sunday 12th March 2017. This highly acclaimed exhibition has specially commissioned works from some of the most sought-after artists in Scotland as well as some highly talented local amateurs ( :-) ). Entry to the exhibition is free and it is a great opportunity to invest in original art. The exhibition will be open from 6.30pm – 9pm Friday, then 10pm -5pm on Saturday and 1pm - 5pm on Sunday. Prices start at £300 for established artists and £100 for up and coming talented artists and will be reduced over the course of the event. But don’t wait too long or you may miss your chance! Delighted to be joining over 60 other artists to showcase our work in aid of such a worthwhile local charity. Great space, and individual hanging really allows you to appreciate each piece, well worth a visit. Very excited to have my image pride of place on the inside cover of the brochure! Lovely to share event with other artists and get such great feedback from visitors in the festive spirit.